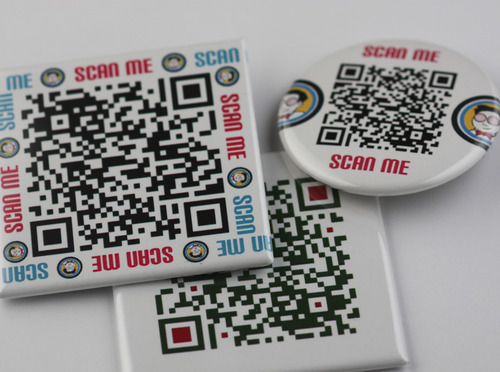 QR Codes or Quick Response codes and buttons are a marriage made in heaven. How to generate your QR code artwork for a button. There are dozens of free code generators online. Try this one or just search for one online. This is done in a millisecond making the transformation from a users mobile phone to the mobile web instantaneous. Putting a QR-code on a button is not really different from putting anything on a button. You need a good quality artwork and you need a reasonable printer. Artwork can be generated online. Just decide on the url you want to link to, fill out a simple online form and most sites email you back a .png file instantly. Layout your sheet as you would normally. Of course a square button is great, especially if you have a square button maker or if you are getting your buttons custom made by a pro, they will have a square button machine, but a round button will also work fine. You can use colour – they do not have to be black – but whatever you do TEST your qr-code before you make a bunch of buttons. Make sure your code works! !